Building a great brand starts with building a great product. Being able to sell said product is all about the story you tell around it. 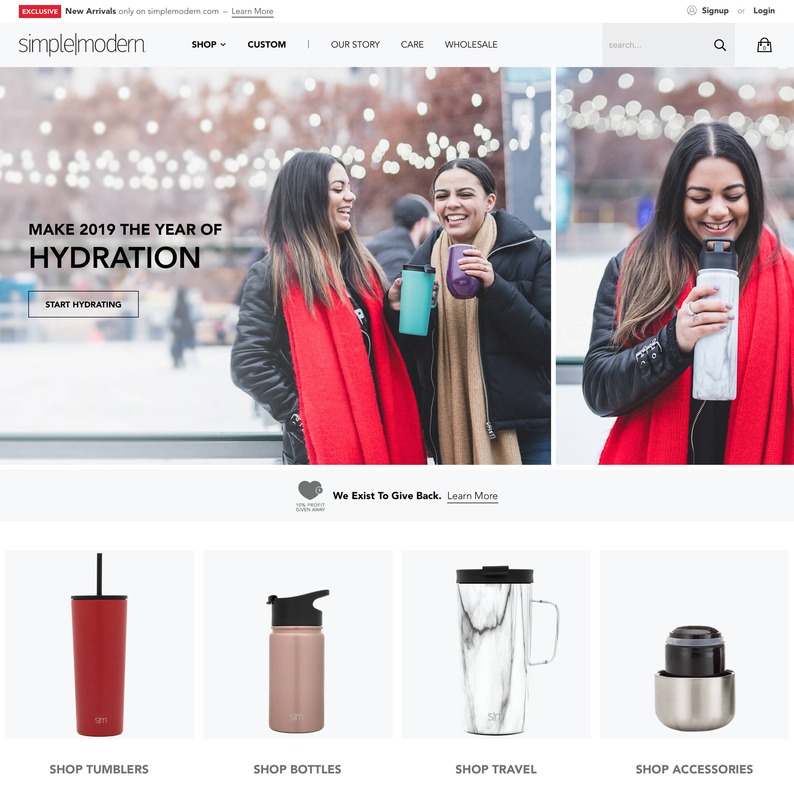 When Simple Modern, a well designed and high-quality water bottle brand, reached out to us to help redesign their website, we recognized immediately the great story they were telling with this product and we were honored to be a part of this project. Simple Modern is an insulated stainless steel water bottle and tumbler company that focuses on building lasting products that make a global impact in a practical way. Going beyond the industry standard of keeping “cold drinks cold, and hot drinks hot”, Simple Modern has embarked on a mission of partnering with organizations who are transforming communities through clean and accessible water. Water is life, and Simple Modern is committed to joining the effort of making this basic commodity available to all. The plan for Simple Modern was to start with a fresh redesign of the website. For a product this beautiful, we needed a clean and highly functional site design. This called for an easy to navigate framework with full, vibrant images showcasing the practicality and polish of the product design. From there our team consulted with Simple Modern to optimize their product organization. With as many colors and styles to select from, being able to navigate to these options quickly was paramount. Through the use of customizable content pages we were able to achieve a navigation that both highlighted the individual product while allowing for customers to browse the offerings and find the exact look and feel they desired. Another major feature Simple Modern needed was for an easy to use and self-servicing wholesale channel for smaller retailers. With Shopify Plus, setting up a wholesale channel has never been easier for merchants. Shopify Plus allows for merchants to setup highly functional wholesale websites using their existing branding, inventory, and customer data: no coding necessary. Merchants can create custom pricing lists based on product and customer groups, volume-based discounts, automated account management, and even order review of invoices on negotiated deals. Wholesale customers now have no-headaches control of when and how they want to purchase with straightforward and clarified order management for the Simple Modern team. Choosing Rehash for our website redesign was a great decision for us. They were able to gather our ideas, make them a reality, and lay them out in a thoughtful way to create a better user experience. Rehash helped us launch before the busy holiday season and stayed with us throughout the process. They get eCommerce and design and we were very fortunate to partner with them on a successful site redesign!